WASHINGTON (AP) — The Trump administration is putting new criteria in place Thursday for visa applicants from six mostly Muslim nations and all refugees, requiring a close family or business tie to the United States. 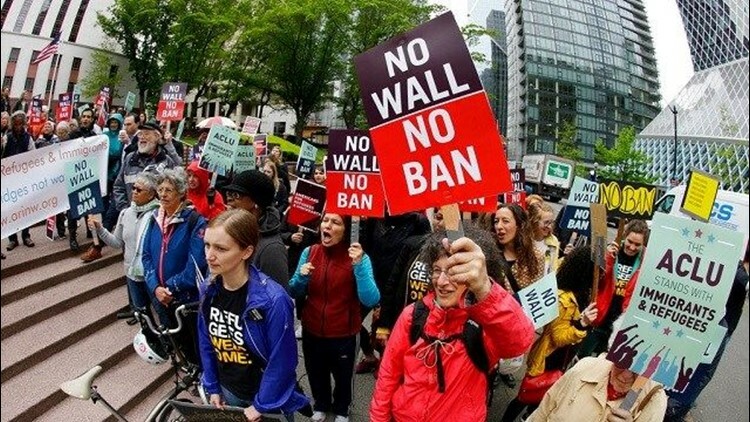 The move comes after the Supreme Court partially restored President Donald Trump's executive order that was widely criticized as a ban on Muslims. Visas that have already been approved will not be revoked. The should help avoid the kind of chaos at airports around the world that surrounded the initial travel ban, as travelers with previously approved visas were kept off flights or barred entry on arrival in the United States. Also, while the initial order took effect immediately, adding to the confusion, this one was delayed more than 72 hours after the court's ruling. The new instructions issued by the State Department will affect new visa applicants from Syria, Sudan, Somalia, Libya, Iran and Yemen. They must prove a relationship with a parent, spouse, child, adult son or daughter, son-in-law, daughter-in-law or sibling already in the United States to be eligible. The same requirement, with some exceptions, holds for would-be refugees from all nations that are still awaiting approval for admission to the U.S.
As far as business or professional links are concerned, the State Department said, a legitimate relationship must be "formal, documented and formed in the ordinary course rather than for the purpose of evading" the ban. Journalists, students, workers or lecturers who have valid invitations or employment contracts in the U.S. would be exempt from the ban. The exemption does not apply to those who seek a relationship with an American business or educational institution purely for the purpose of avoiding the rules. A hotel reservation or car rental contract, even if it was pre-paid, would also not count, it said. There were no major problems reported in the hours after the guidelines were issued. The Middle East's biggest airline says its flights to the United States are operating as normal. Dubai-based Emirates reminded passengers that they "must possess the appropriate travel documents, including a valid U.S. entry visa, in order to travel." Senior officials from the departments of State, Justice and Homeland Security had labored since then to design guidelines that would comply with the ruling. Wednesday's instructions were the result. The new guidance will remain in place until the Supreme Court issues a final ruling on the matter. Arguments before the justices will not be held until at least October, so the interim rules will remain in place at least until the fall. After a federal judge struck down the bans, Trump signed a revised order intended to overcome legal hurdles. That was also struck down by lower courts, but the Supreme Court's action partially reinstated it. The new rules will also affect would-be immigrants from the six countries who win visas in the government's diversity lottery — a program that randomly awards 50,000 green cards annually to people from countries with low rates of immigration to the United States. They will also have to prove they have a "bona fide relationship" with a person or entity in the U.S. or that they are eligible for another waiver. If they, can't they face being banned for at least 90 days. That may be a difficult hurdle, as many visa lottery winners don't have relatives in the U.S. or jobs in advance of arriving in the country.